Income inequality has been the subject of many studies associated with increased violent crime rates. However, these studies tend to have either an international or regional focuses, and they also ignore property crime rates — we accounted for this, and our findings for 2016 were in keeping with historical trends. As you can see, some cities were statistical outliers, breaking with the pattern — in a good way for some, a not-so-good way for others. We ran a regression analysis on the largest American cities’ crime rates and income inequality. To do this, we needed two things: crime data and income inequality metrics. We wanted to make sure we focused on America at large, so we gathered the latest FBI crime data for the 464 most-populated cities in America to test it on a city level. And unlike other studies, we include property crime in our analysis instead of just violent crime. We used the Gini coefficient for our inequality metric, a statistical measurement of dispersion that’s used to measure income disparities in countries. A zero would indicate income equality, and a 1 represents perfect inequality. Neither of these is actually a thing in the real world — of the 464 cities we studied, the lowest Gini was a .34 and the highest was a .63. Income inequality isn’t just an issue on the national stage, it’s a very real problem for American cities. There’s a powerful correlation between cities’ income inequality and their crime rates, including both property and violent crime. Other factors like unemployment, poverty, and number of high school graduates only weakly correlate to the crime rates — alcohol use had no connection to violent crime at all. World Bank studies echoed these findings worldwide. Income inequality alone explained 74% of the variance in murder rates and half of the aggravated assaults. However, social capital had an even stronger association and, by itself, accounted for 82% of homicides and 61% of assaults. A lack of social capital, the value people place in the peace of their communities that comes from being a part of it, is an even greater indicator of violent crime. These may be cyclical, as the “strain theory” suggests that when poorer people perceive inequality, they internalize fewer social norms and come to view crime as more acceptable. Remember that as you read about the particular issues facing the outliers on either side of the statistical line. 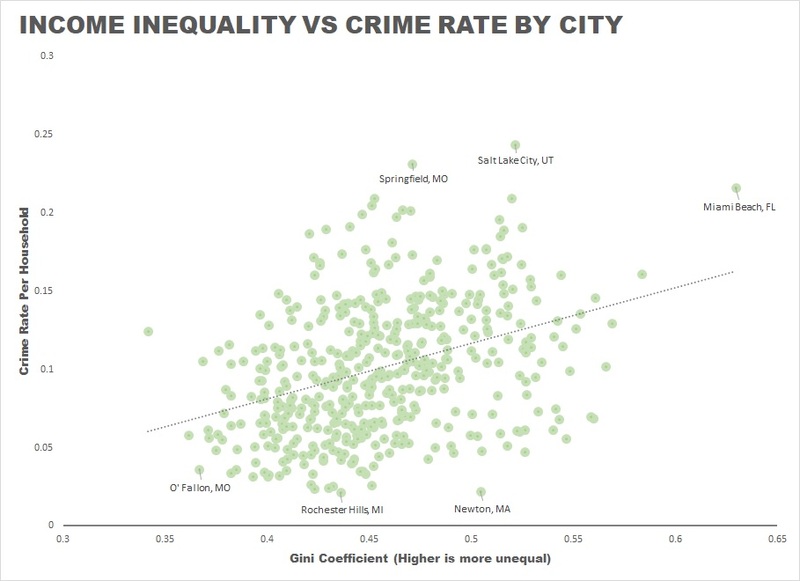 There were some pretty notable outliers, cities whose crime rates were much higher than the statistical model would predict — but there were also cities who you would expect to have much higher crime rates than their income disparities would suggest. Valid assessments are possible only with careful study and analysis of the range of unique conditions affecting each local law enforcement jurisdiction. The data user is, therefore, cautioned against comparing crime data of individual reporting units from cities… solely on the basis of their population coverage. Salt Lake City has the dubious honor of being the single biggest outlier in our dataset. It’s crime rate is almost twice what we’d expect using income inequality as a predictor — even though a 2015 poll indicates that more than half of residents said crime was about average and a quarter think it either under control or better than average. They might not know that it has the highest property crime per household rate in the country. Then again, this perception depends upon where you live, with most of the safe respondents living in the eastern part of town. 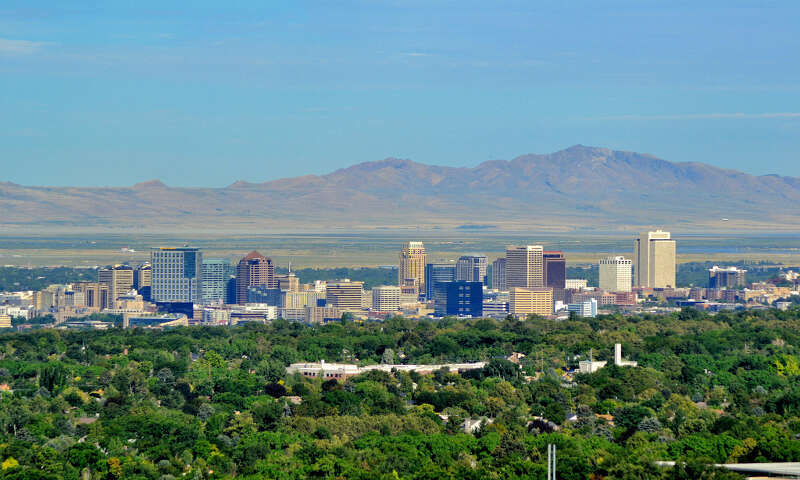 There’s a strong concentration of crime in the west, where homelessness and drug issues abound — this population likely comprises the ten percent of SLC’s residents living on less than $10,000 a year. West Jordan, too, has twice the crime rate we’d expect, even though it’s median income is almost $70,000 and more than 45 percent of the residents make over $75,000. Springfield has already been labeled a “most dangerous city” for violent crime rates by other studies, and this isn’t the place for that — we’re looking at how much overall crime it has per household. Which is a lot, no many how you cut it: it’s crime rate is more than twice what we’d expect. Bear in mind that we’re not talking about just violent crime statistics. 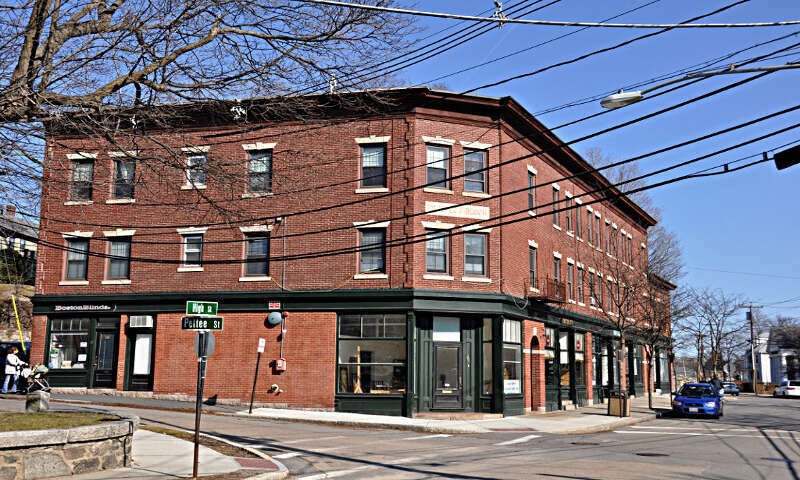 Police said in response to another story that roughly a third of it’s violent crime reports in 2015 were domestic abuse reports, but Springfield also had 14,251 property crimes reported, giving it the second highest property crime rate per household in the country. Nearby St. Louis has only about 25 percent more instances, despite having nearly double the population — and the likelihood of being a victim of a crime in St. Louis is about 25 percent less. 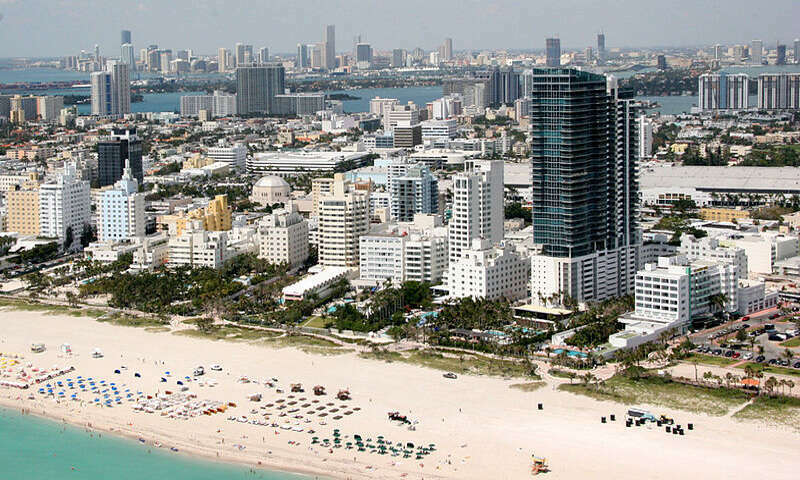 Miami Beach has an enormous amount of property crime per household, 8,419 per 43,266 people. Compared to the City of Miami, it’s a little less than half the number even though it’s about a quarter of the population — and Miami has eight times the number of murders. Miami Beach has a large number of petty, tourism-related theft that accounts for the lion’s share of this. Considering that our numbers are based on households and tourism is a huge number of tourists that don’t factor into this number, it throws things off a bit. It’ll be interesting to see if the November vote to roll back the last-call time will have any impact on the next year’s statistics — we’ll be sure to let you know. When people say they’re from Boston, oftentimes they mean they’re from one of the towns in the Greater Boston area, such as Newton, where the crime rate is the second lowest per household in the country, even though statistically should be five times higher. This town, rated one of the best and safest cities in which to live, is surrounded by colleges, has no murders and only 46 violent crimes in 2016. All of this with a police department that’s smaller than average. There’s little to say here, except that it’s a very affluent, educated, white community with sky-high property values. Almost 60 percent of its households make more than $100,000 dollars a year, and is likely so unequal in income because 29 percent of the households make more than $200,000, meaning you can earn a six-figure salary here still be one of the have-nots. Balancing out the other Missouri city on our list of outliers is the St. Louis suburb of O’Fallon, which statistically speaking should have twice the crime rate it does. All the same, the crime rate has gone down since last year across the board, and considering that other municipalities with half of O’Fallon’s 80,000 people typically have more instances of crime, this is definitely worth mentioning. What’s particularly interesting in the case of O’Fallon is that while the income itself is relatively high, its wealth is fairly evening distributed in a typical bell curve. That said, only 16 percent of the households here earn less than $35,000 a year, so it’ a little skewed towards the high end. 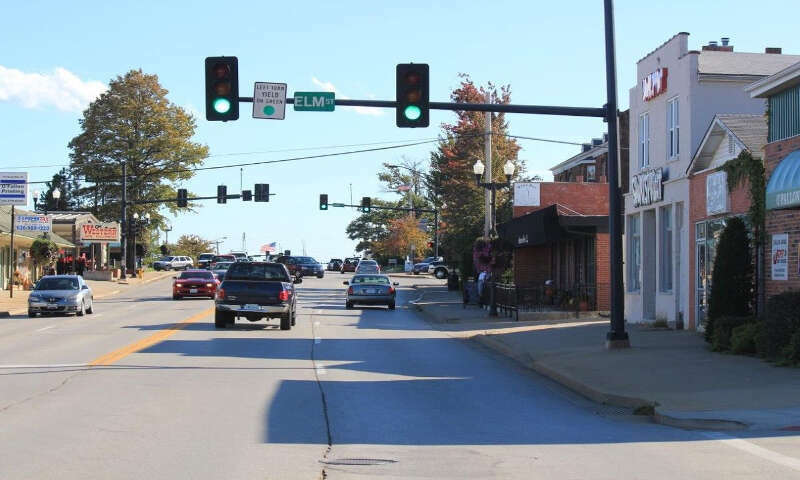 The city’s mayor cites O’Fallon’s police department programs, which engages its citizens through the Citizens Police Academy, Safety Town and the Explorers program, all of which encourage residents to interact with police. 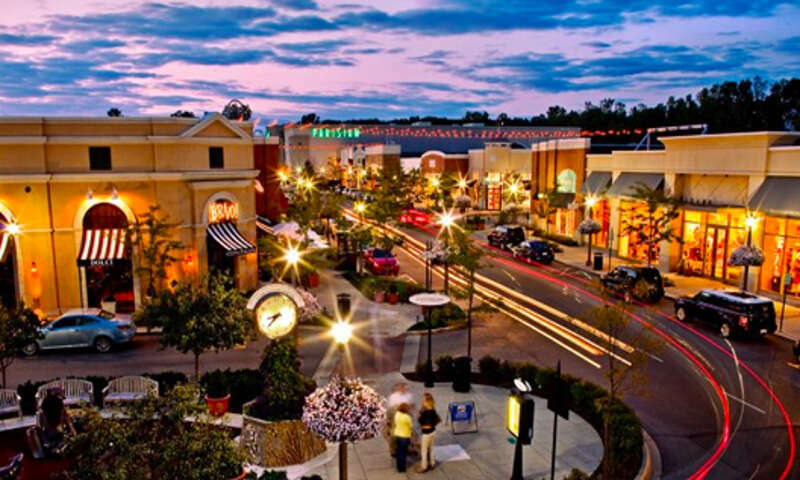 And finally, we have Rochester Hills, the Detroit suburb with the lowest crime rate per household in the country, and has also been listed as one of the best places to live. The city was noted for having the lowest police cost of the communities examined in the study. 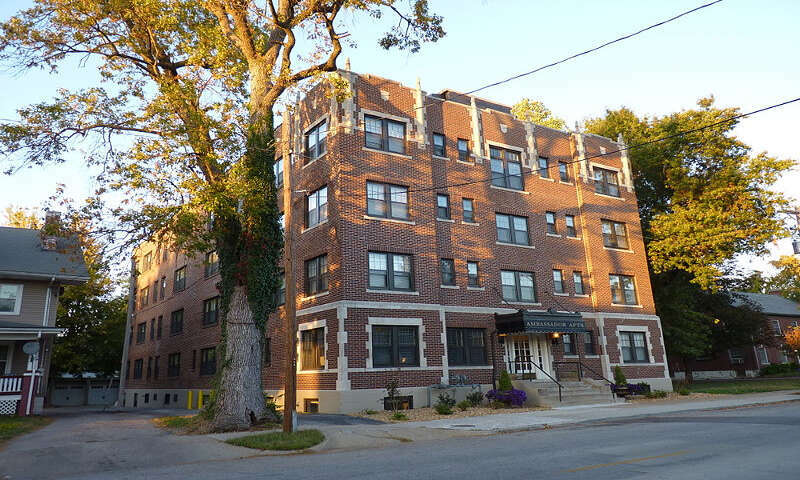 If you want to live in the Detroit area and avoid the crime (and can afford the high cost of housing), then a move to this mid-sized city will prove to be the safest place to raise a family in the country. Studies have already shown that economic disparity yields a serious education gap, burdens government social programs, and muzzles the political efficacy of the middle class across the world. Individuals’ detachment from society can play an even bigger role. We think it’s worth noting that the three low-crime outliers we mention below are suburbs of major metro areas with large crime problems, while the high-crime outliers were in the throws of economic depressions or homeless issues — all forms of social detachment on a large scale.